A new iPhone launch wouldn't really feel complete without its fair share of early bugs and reported problems. So far, Cupertino's iPhone 7 roll out has been a relatively smooth one. There have been reports of hissing noises affecting some models under heavy load, though Samsung's messy ongoing Note 7 recall has no doubt helped to prevent #hissgate chatter from gathering steam. We've also seen how some handsets struggle to regain cellular signal after after Airplane Mode is deactivated. Now, another low-key problem with the new iPhones has emerged. 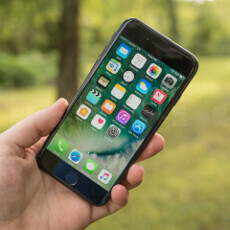 As appleinsider reports, some users have found in-call audio to be distorted or distant, as if the sound is coming from the back of the device. A handful of users -- mostly iPhone 7 Plus owners -- have taken to Apple's support forums in search of answers for the issue. Lowering the volume is said to improve clarity as a temporary fix. Regular, out-of-call audio, meanwhile, is said to be unaffected by this particular bug. It's currently unknown whether the problem is software or hardware-related. If it's the latter, those afflicted will likely be forced to take their devices in for repair or replacement. If we're talking a minor software snag, then Apple should be able to quickly straighten things out with a remedial iOS update. We'll keep you updated on any further developments on this story. In the meantime, let us know in the comments whether you've been affected by this audio issue with your iPhone 7 or 7 Plus. Antennagate version 2.0. I wonder if it'll explode though? that hissgate has no valid report it was just some die hard sammy user reported it to damage the image. But note 7 explosive thing is real . Hey, now we all know what happened to samsungfanboy or whatever his name was. He's baaaaaaack! Lmao! Lol, Exactly! That's who it is. That was a dumb post. Hahaha funny. This would happen to most phones though. How about everyone stop tacking on the word "gate" to every issue the iPhones have. It's worn out and oftentimes incorrect. Except it's not Note users reporting the hissing, it's Apple users. And how exactly does one record an auditory hallucination and post it on YouTube, as several owners have? Who's talking about Notes? Why you gotta bring Samsung products into this article. Did I mention something about Notes? Man, you guys are really loosing it. On this one, I just pointed out how kids can be watched over with modern tech - find my friends was an example. It was mororun that brought thr derogatory remarks that started the whole damn fan war again. http://ow.ly/hXVe304tOhM See here how you brought up Apple (Post 40) in a Note article. Stop being a hypocrite. I brought up their hypocracy - not Apple. The problem is they're hypcoracy happens to involve Apple. Learn to read not just words but meanings too. New notes won't???? Are you sure lol??? Cuz I love my family..
Another news that will disappear in few hours. The pain of denial in your comment is quite evident. The same pain of denial was in ur comment when u got exposed of defending the defunct blackberry. The same pain is evident in your comment because I'm calling out a known troll. You must take it personally, (and you're evidently in a lot of pain as well, considering that you're bringing in an OEM that has nothing to do with this topic, lol) being that we both know that you're a recently banned troll with another account. New accounts like yours are always shown to be suspect by the comments you post.